Christmas is over, but it is definitely still winter and spring seems a long way off. It’s dark and cold, the weather is mostly horrible and it might seem like there’s not much to look forward to. It’s easy for a bad case of the winter gloomies to set in, when all you want to do is wear your pyjamas and eat chocolate. Sewing and other crafts are believed to help if you are feeling fed up, to such an extent that it is even being used as part of ongoing treatment for depression and PTSD. I wrote a post about this which you can read here. So one of the best things you can do to beat the winter blues is to get making stuff! I actually quite like winter. One of my favourite things is being tucked up at home and feeling cosy while it’s cold and nasty outside. The Danish have a word, hygge, which as far as I can make out means cosy times at home with friends and family. If you’re interested in finding out more about this, this is an excellent book which I read and thoroughly enjoyed. Plus the guy’s name is Mike Viking! This is an affiliate link. To beat the winter blues, I like to combine my favourite being cosy at home things with sewing! So if winter is getting to you a little bit, here are some (mostly) sewing related tips to help you beat the winter blues. 1. Make something that will make going outside more bearable. Fresh air and exercise can make you feel better but you will not feel better if you are not wrapped up properly against the weather. If you knit or crochet, you could make socks, a scarf or a hat. If you prefer sewing, you could sew a scarf or hat from snuggly fabric, or even a coat! When we were in Norway in October it was cold. I didn’t see a single person in silly shoes, thin tights and a skimpy jacket more for decoration than for actual warmth. People dressed for the weather. Duvet coats, hats, scarves and warm boots. Cold weather is not so bad if you are dressed for it! 2. Make something to make being at home cosier. You could make some cushions. I just make covers and pop them over the existing cushions, then change them when I get bored or I want something summery instead. 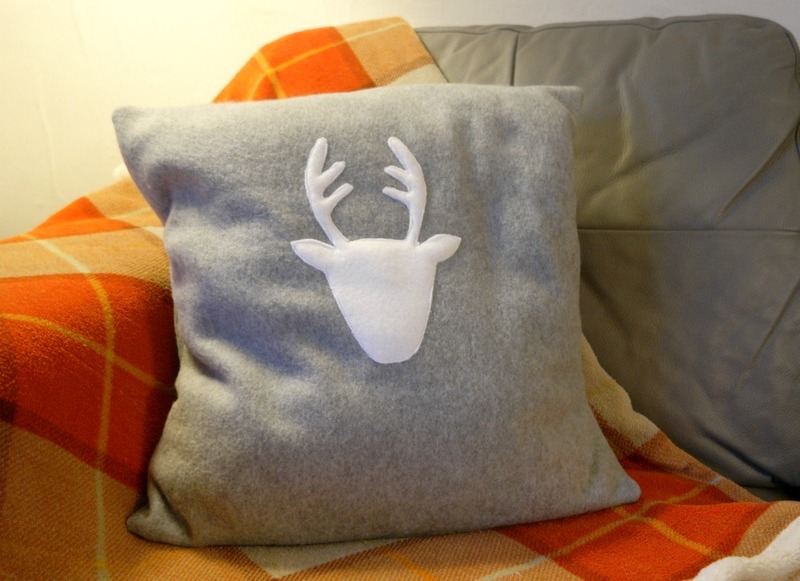 I made these reindeer cushions for Christmas but they’re fine for the rest of winter. 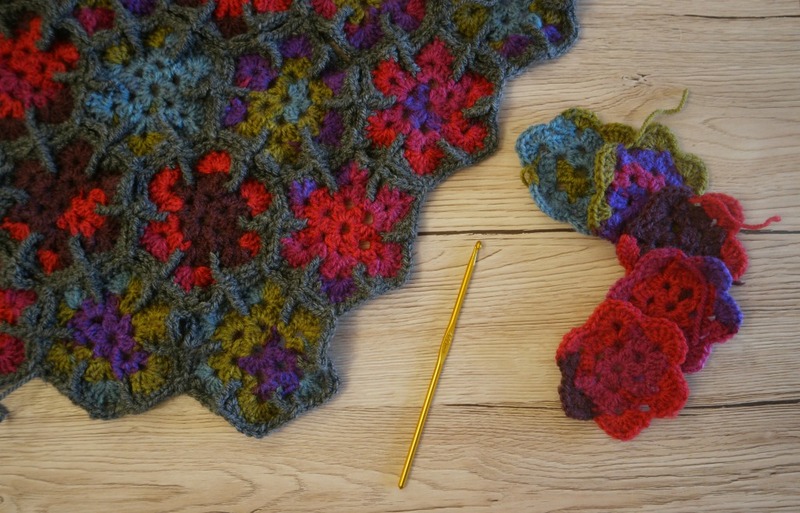 Another option is to make a cosy throw or blanket. Try fleece or another warm, woolly fabric if you are not a knitter. One of my favourite things about winter is coming home, putting the lamps on, lighting the fire and snuggling up on the sofa with a blanket and a cup of tea. You can’t do that in the summer! 3. Make something for the kitchen. Another nice thing about winter is coming home to a casserole bubbling away in the slow cooker. A nice new pair of oven gloves, some pot holders or some embroidered tea towels could be just the thing to make spending time in the kitchen even better. 4. Make something for yourself to wear around the house. I’m not talking onsies here (although you could try if you wanted to!). 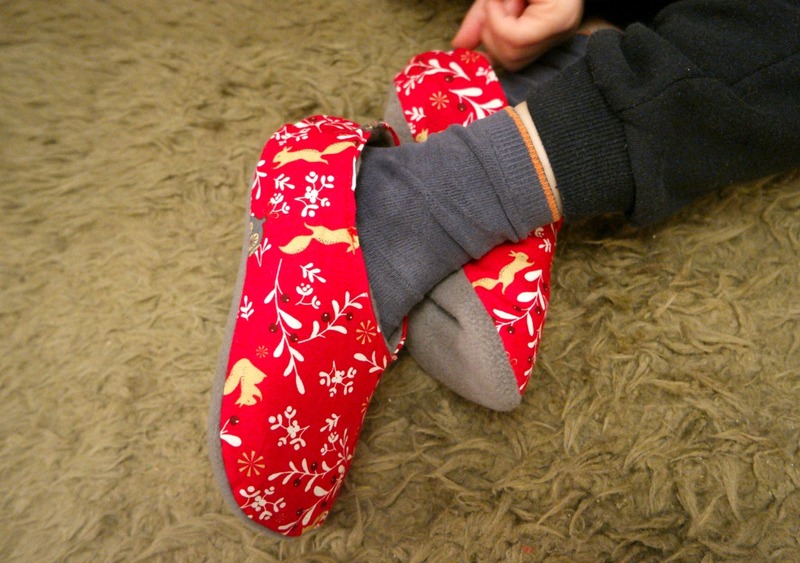 Having cold feet is not fun, so you could make yourself some slippers. Or you could sew a jacket or cardigan to wear if you feel chilly at home. 5. Have a project to work on in the evenings or when you have a minute. Knitting and crochet are great for this. A patchwork quilt would be another option. Or if a quilt is too much, you could try some scrap projects. Preparing your scraps and planning how you are going to use them is a nice, calm thing that you can do in the evening. 6. Plan a big project. Having something to work towards can help to take your mind off things if you’re feeling a bit gloomy. You could make a fancy outfit or a jacket, or a big scrap or patchwork project. If you don’t feel up to making anything that’s going to take a long time, you could make something smaller, like a bag or a cushion. Make a big thing of it. Plan the colours (Design Seeds is great for colour schemes), choose the fabric and plan it all out. Long dark evenings and horrible weather provides the perfect excuse for staying at home and working on your project! 7. Dig out any unfinished projects from last year and resolve to finish them. Making decisions often makes us feel better. If you really don’t want to finish something, or know that you won’t, unpick it and put the pieces in your fabric collection. 8. Learn a new craft. 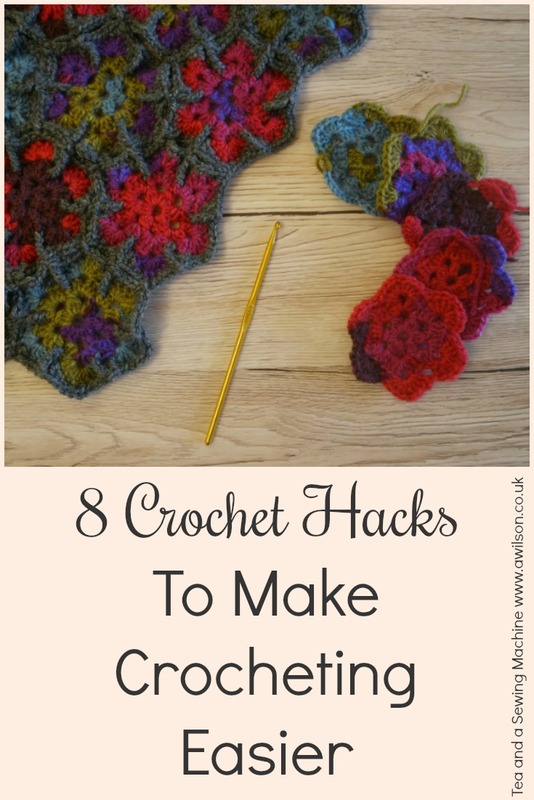 Crochet is fun and easy. Wet felting is good too (there are kits here. This is an affiliate link) or you could try needle felting (also an affiliate link. I haven’t tried it but it’s on my list!). If you’ve tried knitting but didn’t got on with it, Norwegian knitting is much easier, especially when you’re knitting with 2 colours. There’s a video on YouTube here. The actual knitting starts at around 11-12 minutes. I have discovered that I am actually a knitter, I just had to find a way of doing it that worked for me 🙂 . 9. Have a sort out. There’s nothing like having a good rummage and finding things that you’d forgotten you had. And there’s nothing like the sense of satisfaction you gain when what was once an out of control mountain of mess that was spawning mini mountains of mess everywhere, is all neat and tidy and packed into boxes. 10. By a daffodil or another spring plant in a pot and make it a cosy. Early spring flowers are a great way to beat the winter blues! 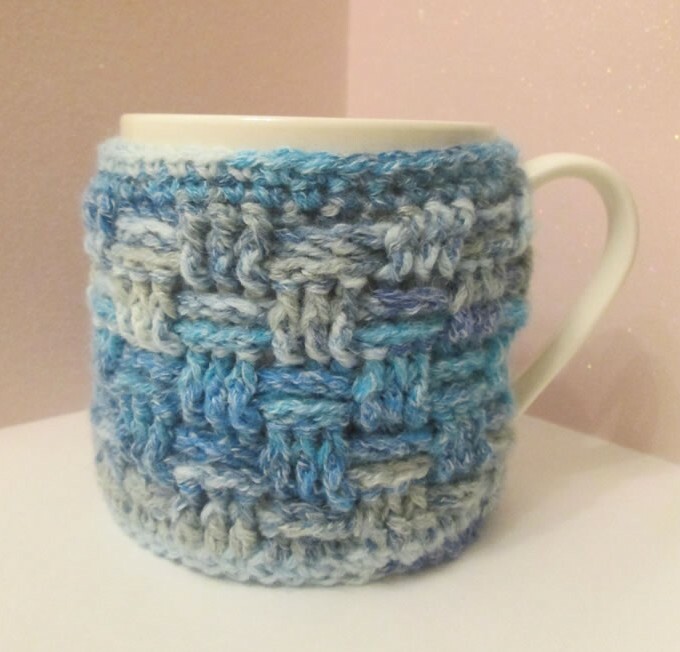 This crocheted cosy and this quilted one are actually for mugs, but they could be adapted to fit a plant pot. With lots to keep you busy, the longer days and warmer weather will be back before you know it! 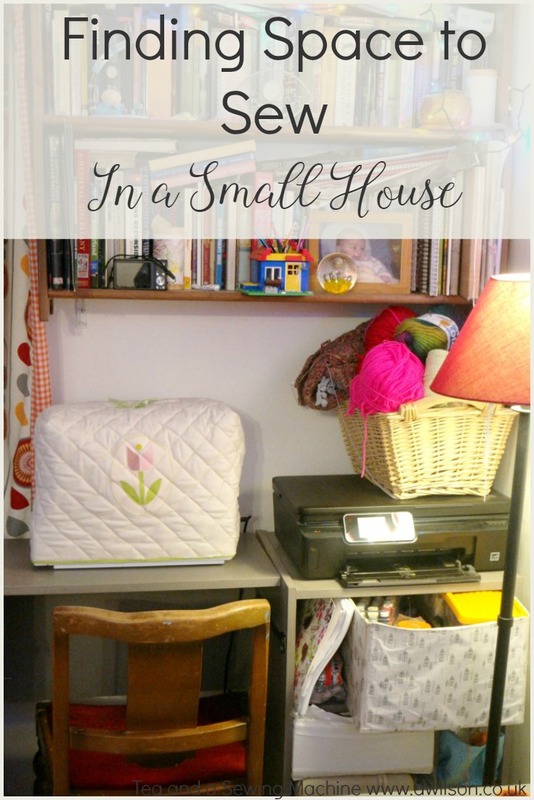 Finding space to sew in a small house can be tricky, but it’s not impossible! As someone who sews a lot, I know how much of a difference it makes when you can leave your sewing machine out. Suddenly sewing for 10 minutes is an option. If you have to allow 10 minutes to get it out before you can start sewing, then clear up your sewing stuff and pack your machine away again at the end, you need to have a good chunk of time to make it worth it. And there’s no point if you know that people are going to need to sit down for dinner at the table you want to use in half an hour’s time! 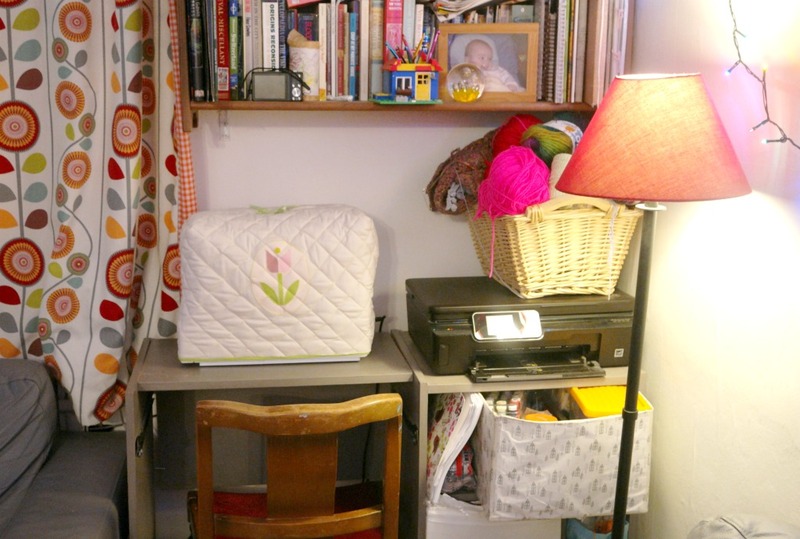 With all the beautiful sewing rooms on Pinterest, it’s easy to feel that having a permanent space to sew not an option for you if you live in a small house or flat and if you don’t have the spare cash to splurge beautiful storage that all matches. Well, I’m going to tell you a secret. You don’t need a whole room! I sew all the time. We live in a fairly small house. There are 6 of us, plus the cat. 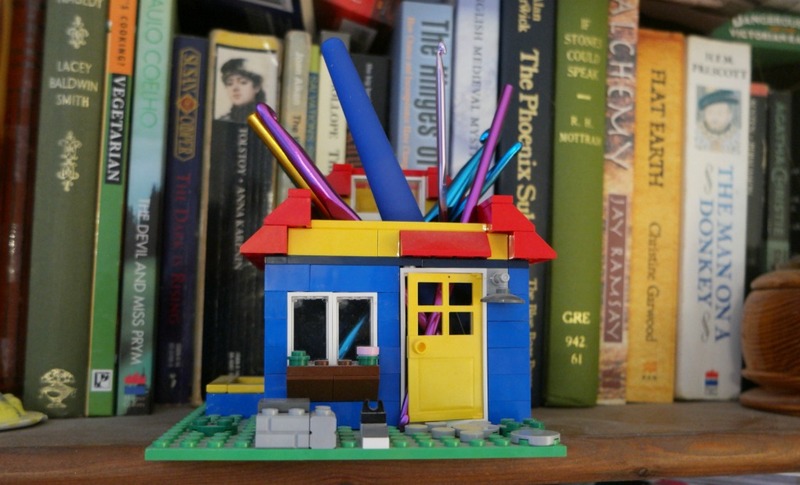 There’s Lego everywhere, and usually piles of laundry. I can’t justify taking a whole room when the kids are already sharing. So I don’t! Instead, I have a corner in the living room. I leave my sewing machine up and I have some space for sewing related stuff. If you’re wondering where on earth my fabric is, it’s behind the bedroom door. I’ve shared my fabric mountain before and I’ve resolved to do something about it this year, as it’s started to spawn mini mountains elsewhere in the bedroom. That’s another blog post! So what do you do if you need a space to sew but you don’t have the space, the furniture or the money? 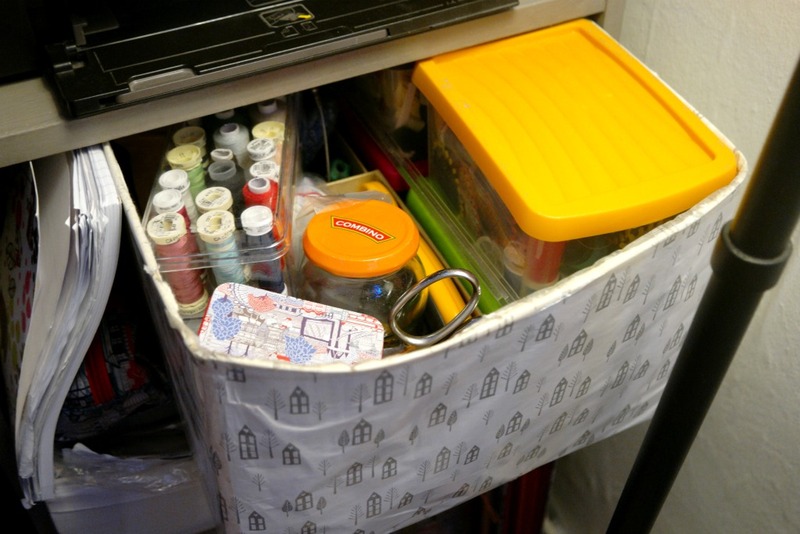 Here are some tips for you if you are struggling with finding space to sew in a small house. Like I said, your space to sew doesn’t need to be a whole room. You just need enough space to wedge yourself in with your sewing machine. 1. Do you have any space that you are not currently using that would be big enough for yourself and your sewing machine? Think hallway, landing, under the stairs, empty corner of bedroom/ living room. 2. Could you rearrange things a bit to make some space? My sewing area became free when we got new sofas and changed the layout in the living room. If moving the furniture around won’t give you more space in that room, could you move some of it to a different room? 3. If you’re lucky enough to have a room or an area that doesn’t get used very often, you could use it for your sewing machine. 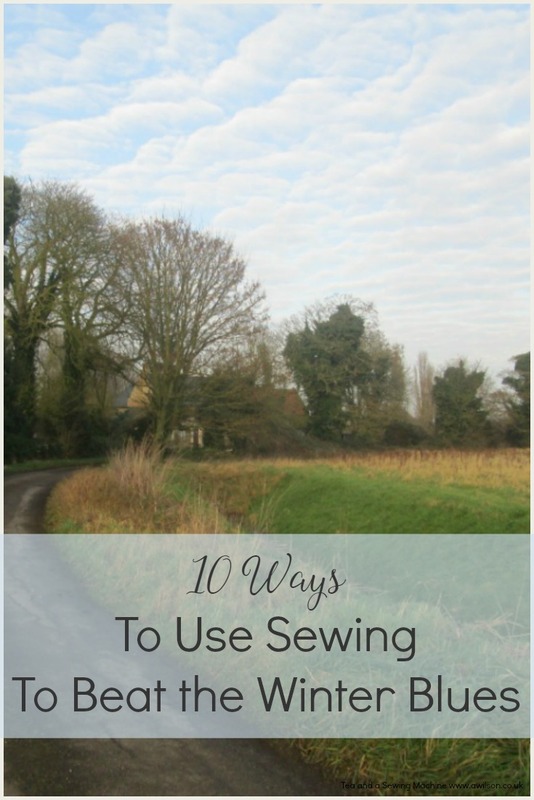 Even if you have to pack it away every couple of weeks, that will still give you more sewing time than if you have to put things away before every meal time. Lovely as it would be to spend a fortune on purpose built craft furniture, for lots of us it just isn’t an option. 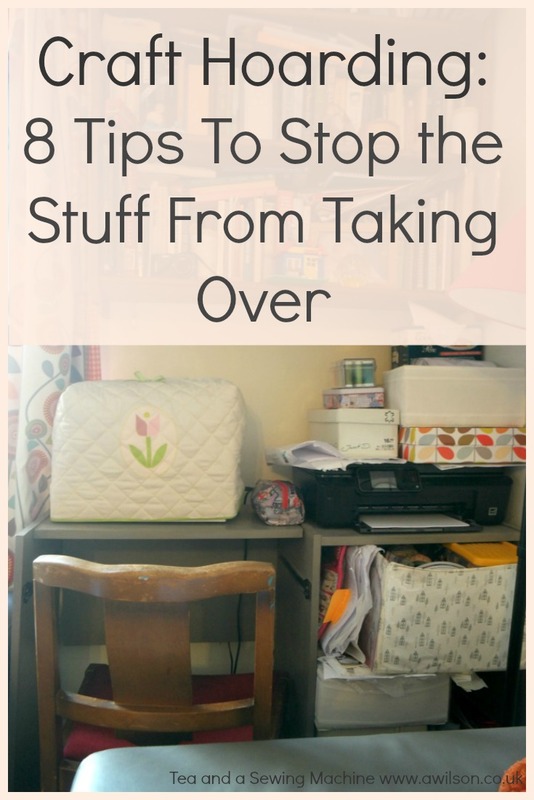 But like with whole sewing room myth, you don’t need bits of expensive furniture either! My sewing desk thing is actually a computer table bought from Ikea 15 years ago. It became redundant when we swapped the enormous desktop computer for a laptop. At the time, I took it apart and stashed it down the side of a wardrobe. When I need a table for my sewing machine, I remembered that I had this, so I got it out and put it back together! It had turned an unattractive shade of orange, but mercifully a couple of coats of Annie Sloan paint improved things quite a lot! There’s room for my sewing machine (and my legs!) and there are cubbies for storing sewing stuff. I do have to share it with the printer though. The computer desk had a fold away section for the keyboard. I removed this and covered both sides in sticky backed plastic. One side looks like wood, the other side looks like wood painted white. I use it for photos for Instagram and it lives under the sofa when it’s not being used. So here’s what you can do to find furniture for your sewing space. 1. Look at what you have already. You might be surprised to find that you already have something you can use. It doesn’t need to be fancy or perfect, it just needs to be big enough for your sewing machine and your legs. 2. If you really don’t have anything, try charity shops or junk shops. You might even find that somebody is throwing out something you could use! If it’s a horrible colour you can always paint it. 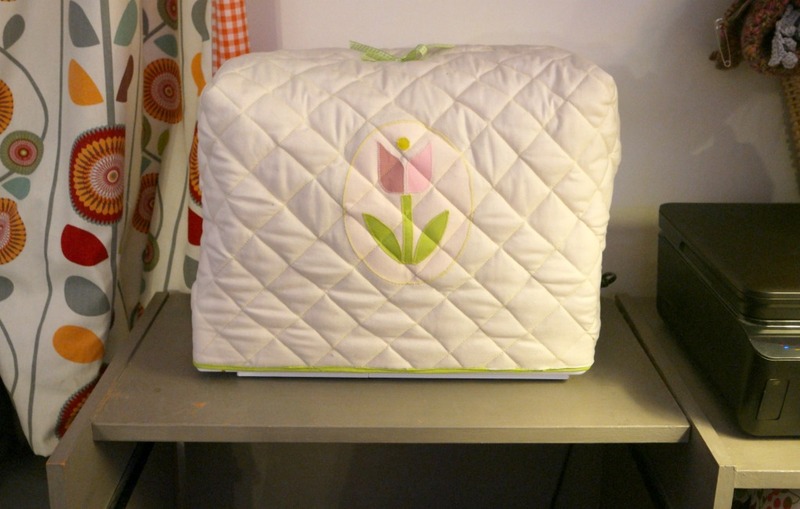 The sewing rooms on Pinterest all have beautiful storage. Every kind of caddy, box and container and beautiful co-ordinating colours, with sewing supplies tastefully and carefully organised. And if you don’t want to spend a fortune, well, you could take 2 months out of your life to make it all yourself! Of course, most normal people probably don’t have the money or the time. Although you could make some stuff yourself (these little fabric boxes come together quite quickly), you’ll never use your sewing space if you take several months making stuff for it! Instead, you could try these. 1. See what you have already. A bit of a sort out or some reorganisation might free up a basket or box or two. The basket where my wool lives was previously home to toiletries I was never going to use and other junk that I threw out or rehomed. 2. Cover cardboard boxes in pretty paper, fabric or sticky back plastic. My drawer is a cardboard box covered in wrapping paper. I reinforced the edges with sellotape. 3. Buy cheap plastic or cardboard boxes. I got some little plastic boxes from Wilko. They were £5 for 4. Or Tesco have Chinese takeaway sized plastic boxes at £2 for 8. These cardboard boxes from Amazon are £15 for 10. The sides are not very strong but the lids help them to keep their shape. 4. Be super thrifty and keep all your jars and tins! These will work for keeping buttons and ribbon safe. If you’re trying to find space to sew at home, I hope you found this useful. If you have tips to add, please leave them in the comments! I’ll do my best to reply to all of them!